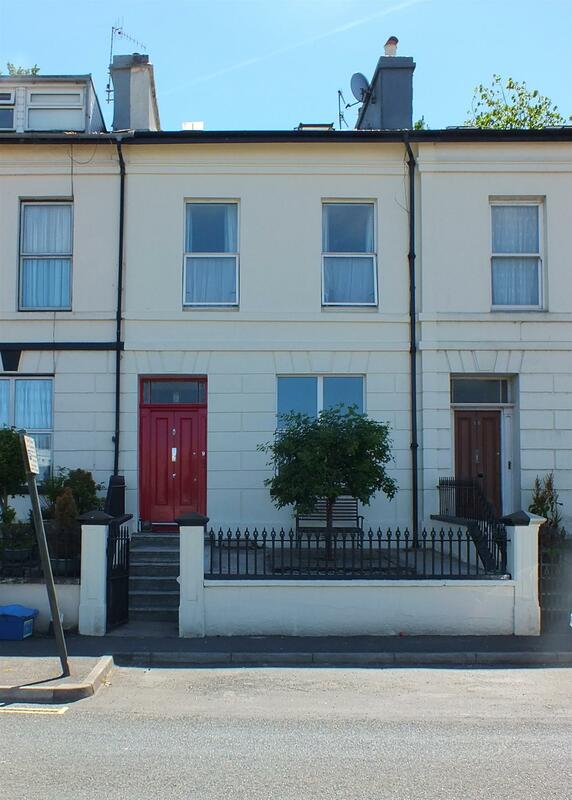 Traditional 4 Bed Mid Terrace Town House in a Very Convenient Location. Walking Distance of Finance Sector & Within Parking Disc Zone 'A'. Quayside, Restaurants, Pubs & Tesco Super Store Within Walking Distance. Naturally Bright & Spacious Accommodation Set Over 3 Floors. Comprising Lounge, 'Cooke & Lewis' Breakfast Kitchen & Utility Room. 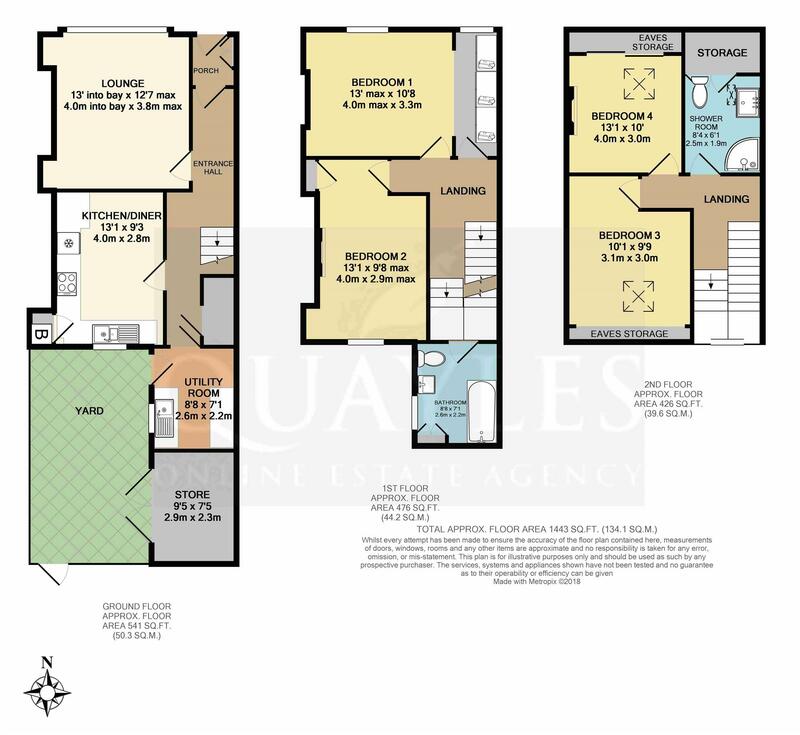 1st Floor: 2 Bedrooms (1 with Open Plan Dressing Area) & Family Bathroom. 2nd Floor 2 Further Bedrooms & Shower Room with Additional Storage Space. Gas Fired Central Heating & uPVC to Primary Rooms. Enclosed Front Garden & South Facing Rear Yard & Additional Terraced Garden. Travel down Athol Street continuing straight across at the traffic lights and onto Bridge Road. Continue straight ahead to the mini roundabout taking a right turn onto the Old Castletown Road. Number 9 will be found a short distance along on Leigh Terrace, being clearly identified by our For Sale board, with lay by parking directly outside. Original gate and railings. Primarily paved for ease of maintenance. Steps up to the main entrance. An original wooden entrance door with glazed top lights leads into the vestibule. Cupboard housing the consumer unit (installed Jan 2018). Coat hooks and space for a shoe store. Original cornice and dado rail. Vinyl floor covering. Telephone point. Obscure glazed, panelled door to the entrance hall. Stairs with a useful 'larder cupboard' beneath lead to the upper floors. Original cornice and corbels. Coat hooks. Telephone point. A spacious room benefiting from many original features including fully operational shutters, a cast iron open grate fireplace, cornice, picture rail and stripped pine fireside cupboards. Modern floating shelves to the alcoves. TV and satellite points. Fitted to the side and rear with an excellent range of 'Cooke & Lewis' wall, base and drawer units together with wood effect work surfaces incorporating a 1 1/2 bowl stainless steel sink with a lever mixer tap. Integrated fridge and dishwasher. Two larder style cupboards one with pull out racking. Inset four ring ceramic hob with a pull out filter above and a built in electric double oven beneath. Cupboard concealing the 'Vaillant' gas fired combi boiler. Background tiling. Picture rail. Cafe light. A large uPVC window looks out into the enclosed rear yard. Tiled to mid height. Fitted base units to match the kitchen. Laminate work surfaces incorporate a stainless steel sink with a lever mixer tap. Coved ceiling and uPVC double glazed window. Plumbed for washing machine and space for a tumble dryer. Space for an 'American' style fridge freezer. Laminate floor covering. Half double glazed uPVC door to the yard. Door to the bathroom. Steps continue to the main landing. Attractive wood panelled walls to mid height with partial splashback tiling. Fitted with a traditional white suite of WC, pedestal basin and panelled bath with a mixer shower attachment and folding screen. Tongue and groove ceiling with inset spotlights. Obscure glazed uPVC window. Wall light. Vinyl floor covering. Useful built in cupboard. Stairs with an original timber framed sash window at half the half landing lead to the second floor. Smoke detector. Formerly two rooms (original door in situ). The dressing area has a uPVC window to the front elevation and a clear opening to the bedroom. Fitted with a wall of built in, full height wardrobes. Picture rail. A generous double room which could easily be closed in to provide an extra room. Large uPVC window to the front. Picture rail. A double room with a large uPVC window to the rear looking up to the terraced garden. Original, unused fireplace. Built in cupboard to one corner. Picture rail. Please see floor plan for shape of room. Currently home to a large bookshelf. Would make an ideal study area or snug reading corner. Smoke detector. Tiled to mid height and fitted with a modern white suite of WC with a concealed cistern along with a vanity unit with a top mounted basin, glass shelf, shaver point and light above. Quadrant enclosure with a 'Mira Jump' electric shower installed. Access to eaves storage space. Small roof window. Vinyl floor covering. A large single/ small double room with a sloping ceiling to the front incorporating a 'Velux' roof light with a blackout blind. Original cast iron open grate fireplace with integral mantle. Access to extensive eaves storage space. Light on a dimmer control. An 'L' shaped small double room with a sloping ceiling to the rear incorporating a large 'Velux' window with a fitted blackout blind. Original cast iron open grate fireplace and surround. Reduced height to the rear. Wall lights on a dimmer control. A very private, south facing area which we are informed by the owners is quite a 'sun trap'. Two wooden doors access the store room. Gated access to service path with private steps up to the terraced garden. A useful space which some residents in the terrace have incorporated into the utility room to make a separate kitchen enabling them to reinstate the former dining room (breakfast kitchen). Picture taken from Bedroom 2. Steps lead up from the rear service path. Timber shed. Terraced with further steps continuing up to a larger patio area at the top of the garden. All mains services are installed. Gas fired central heating (town gas) and primarily double glazed.